The Wahlberg's Eagle (Aquila wahlbergi) is a bird of prey. Like all eagles, it belongs to the family Accipitridae. This bird is named after the Swedish naturalist Johan August Wahlberg. 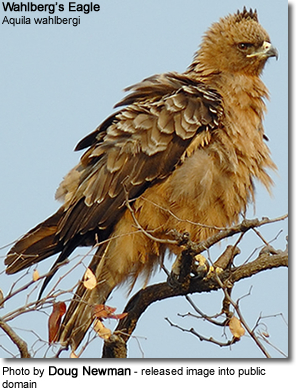 Wahlberg's Eagle breeds in most of Africa south of the Sahara. It is a bird of woodland, often near water. 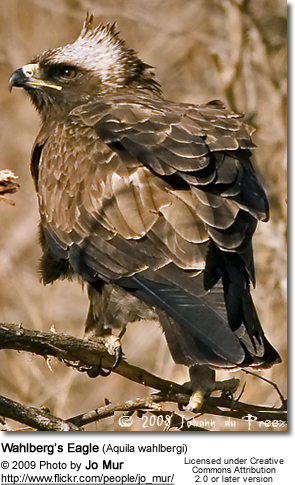 Wahlberg's Eagle is a medium-sized raptor. It is about 55-60 cm in length and has a wingspan of 130-160 cm. Body mass is 1.04kg (2lb 05oz) for males and 1.3kg (2lb 14oz) for females on average. The plumage is dark brown except for dark streaked grey undersides to the flight feathers, and a barred grey undertail. The head has a small crest, and the legs are yellow. There is a pale variant which is much lighter brown with whitish, rather than grey undertail and flight feather undersides. In flight, this species is very cross-shaped, with long evenly wide wings, a slim body and long narrow square-ended tail. The wings are held very flat. The large brown eagles are generally a tricky group to identify, but distinctive features of Wahlberg's Eagle include: round nostrils which separates it from Tawny and Steppe Eagles, although the two Spotted Eagles also have round nostrils; some form of a crest is usually visible; the gape only extends at maximum to the middle of the eye, whereas in Lesser Spotted Eagle, it extends to the back of the eye. There are both light and dark phases of this species. It builds a stick nest in the fork of a tree or the crown of a palm tree. The clutch is one or two eggs. Wahlberg's Eagle hunts reptiles, small mammals and birds. The call is a whistled kleeah-kleeah-kleeah.